Vibrio vulnificus is a gram-negative bacillus that only affects humans and other primates. It is in the same family as bacteria that cause cholera. The first documented case of disease caused by the organism was in 1979. See image below, as well as the article Vibrio Infections. Vibrio infections. Early bullous lesions appear over the dorsum of the foot of a patient with cirrhosis. V vulnificus infects the body in 2 ways, either by exposure to contaminated seafood, such as raw oysters, or through an open wound exposed to contaminated seawater. Among healthy individuals, within 16 hours of ingestion, they experience vomiting, diarrhea, and abdominal pain. Many patients develop distinctive bullous skin lesions. In patients who are immunocompromised, particularly those with chronic liver disease (especially cirrhosis), immunosuppression, end-stage renal disease, and hematopoietic disorders, V vulnificus can cause life-threatening septic shock and blistering skin lesions. Those who are immunocompromised are at a much greater risk for contracting V vulnificus and dying from overwhelming sepsis. It is seen in a variety of seafood. V vulnificus can grow rapidly in shellfish owing to the ambient air conditions occurring with intertidal exposure. A study of Vibrio species isolated from retail shrimp in Hanoi found 201 of 202 samples were positive, with most having Vibrio parahaemolyticus (96.5%) and V vulnificus documented much less often, specifically in only 1.5%. Sanitary working conditions and well-cooked shrimp should be encouraged. All races are affected equally. All ages are affected equally. Most V vulnificus infections are acute but have no long-term consequences; however, in patients who develop septic shock from infection with V vulnificus, the mortality rate is 50%. A 2017 case report describes a man becoming infected with V vulnificus after swimming in the Gulf of Mexico 5 days after the completion of a leg tattoo. The patient died from septic shock; his chronic liver disease was cited as a possible contributing factor. Retrospective analysis of 30 patients with necrotizing fasciitis and sepsis caused by Vibrio species and initially treated with surgical debridement or immediate limb amputation showed 11 (37%) died within several days of admission. A higher mortality rate was noted with the Vibrio cholerae non-O1 group (57%) compared with the V vulnificus group (30%). Other bad prognostic signs included a systolic blood pressure of less than or equal to 90 mm Hg, decreased platelet counts, and leukopenia. The combination of hepatic dysfunction and diabetes mellitus was also associated with a poor outcome. Lim PL. Wound infections in tsunami survivors: a commentary. Ann Acad Med Singapore. 2005 Oct. 34(9):582-5. [Medline]. Park SY, Yu SN, Lee EJ, Kim T, Jeon MH, Choo EJ, et al. Monomicrobial gram-negative necrotizing fasciitis: An uncommon but fatal syndrome. Diagn Microbiol Infect Dis. 2019 Jan 4. [Medline]. Phillips KE, Satchell KJ. Vibrio vulnificus: From Oyster Colonist to Human Pathogen. PLoS Pathog. 2017 Jan. 13 (1):e1006053. [Medline]. Tiba-Casas MR, Lemes-Marques EG, Almeida EA, Soares FB, Camargo CH. Draft Genome Sequence of a Pathogenic Vibrio vulnificus Strain Isolated in Brazil. Genome Announc. 2018 Feb 15. 6 (7):[Medline]. Rosche TM, Yano Y, Oliver JD. A rapid and simple PCR analysis indicates there are two subgroups of Vibrio vulnificus which correlate with clinical or environmental isolation. Microbiol Immunol. 2005. 49(4):381-9. [Medline]. Broza YY, Raz N, Lerner L, Danin-Poleg Y, Kashi Y. Genetic diversity of the human pathogen Vibrio vulnificus: a new phylogroup. Int J Food Microbiol. 2012 Feb 15. 153(3):436-43. [Medline]. Jones JL, Kinsey TP, Johnson LW, Porso R, Friedman B, Curtis M, et al. Effects of Intertidal Harvest Practices on Vibrio parahaemolyticus and Vibrio vulnificus Levels in Oysters. Appl Environ Microbiol. 2016 May 20. [Medline]. Tra VT, Meng L, Pichpol D, Pham NH, Baumann M, Alter T, et al. Prevalence and antimicrobial resistance of Vibrio spp. in retail shrimps in Vietnam. Berl Munch Tierarztl Wochenschr. 2016 Jan-Feb. 129 (1-2):48-51. [Medline]. Froelich BA, Williams TC, Noble RT, Oliver JD. Apparent Loss of Vibrio vulnificus from North Carolina Oysters Coincides with a Drought-Induced Increase in Salinity. Appl Environ Microbiol. 2012 Jun. 78(11):3885-9. [Medline]. Inoue Y, Ono T, Matsui T, Miyasaka J, Kinoshita Y, Ihn H. Epidemiological survey of Vibrio vulnificus infection in Japan between 1999 and 2003. J Dermatol. 2008 Mar. 35(3):129-39. [Medline]. Sangeetha MS, Shekar M, Venugopal MN. Occurrence of clinical genotype Vibrio vulnificus in clam samples in Mangalore, Southwest coast of India. J Food Sci Technol. 2017 Mar. 54 (3):786-791. [Medline]. Baker-Austin C, Oliver JD. Vibrio vulnificus: new insights into a deadly opportunistic pathogen. Environ Microbiol. 2018 Feb. 20 (2):423-430. [Medline]. Huang KC, Tsai YH, Huang KC, Lee MS. Model for End-Stage Liver Disease (MELD) Score as a Predictor and Monitor of Mortality in Patients with Vibrio vulnificus Necrotizing Skin and Soft Tissue Infections. PLoS Negl Trop Dis. 2015 Apr. 9 (4):e0003720. [Medline]. Tsai YH, Huang TJ, Hsu RW, et al. Necrotizing soft-tissue infections and primary sepsis caused by Vibrio vulnificus and Vibrio cholerae non-O1. J Trauma. 2009 Mar. 66(3):899-905. [Medline]. Kuo Chou TN, Chao WN, Yang C, Wong RH, Ueng KC, Chen SC. Predictors of Mortality in Skin and Soft-tissue Infections Caused by Vibrio vulnificus. World J Surg. 2010 Feb 12. [Medline]. Haq SM, Dayal HH. Chronic liver disease and consumption of raw oysters: a potentially lethal combination--a review of Vibrio vulnificus septicemia. Am J Gastroenterol. 2005 May. 100(5):1195-9. [Medline]. Partridge DG, Townsend R, Larkin S, Parsons HK. Vibrio vulnificus: an unusual mode of acquisition and novel use of rapid susceptibility testing. J Clin Pathol. 2009 Apr. 62(4):370-2. [Medline]. Choi HJ, Lee DK, Lee MW, Choi JH, Moon KC, Koh JK. 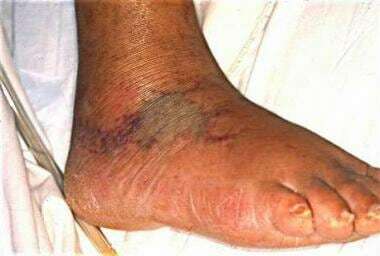 Vibrio vulnificus septicemia presenting as purpura fulminans. J Dermatol. 2005 Jan. 32(1):48-51. [Medline]. Tajiri T, Tate G, Akita H, et al. Autopsy cases of fulminant-type bacterial infection with necrotizing fasciitis: group A (beta) hemolytic Streptococcus pyogenes versus Vibrio vulnificus infection. Pathol Int. 2008 Mar. 58(3):196-202. [Medline]. Kitamura C, Yamauchi Y, Yamaguchi T, Aida Y, Ito K, Ishizawa Y, et al. Successful Treatment of a Case of Necrotizing Fasciitis due to Vibrio vulnificus in a Cold Climate in Japan. Intern Med. 2016. 55 (8):1007-10. [Medline]. Tsai YH, Wen-Wei Hsu R, Huang KC, Huang TJ. Comparison of necrotizing fasciitis and sepsis caused by Vibrio vulnificus and Staphylococcus aureus. J Bone Joint Surg Am. 2011 Feb. 93(3):274-84. [Medline]. de Klerk A. Should a patient have access to his medical records. Med Law. 1989. 8 (5):475-83. [Medline]. Inoue H. Vibrio vulnificus infection of the hand. J Orthop Sci. 2006 Jan. 11(1):85-7. [Medline]. Tsai YH, Hsu RW, Huang TJ, et al. Necrotizing soft-tissue infections and sepsis caused by Vibrio vulnificus compared with those caused by Aeromonas species. J Bone Joint Surg Am. 2007 Mar. 89(3):631-6. [Medline]. Tsai YH, Chen PH, Yu PA, Chen CL, Kuo LT, Huang KC. A multiplex PCR assay for detection of Vibrio vulnificus, Aeromonas hydrophila, methicillin-resistant Staphylococcus aureus, Streptococcus pyogenes, and Streptococcus agalactiae from the isolates of patients with necrotizing fasciitis. Int J Infect Dis. 2019 Apr. 81:73-80. [Medline]. Lee YC, Hor LI, Chiu HY, Lee JW, Shieh SJ. Prognostic factor of mortality and its clinical implications in patients with necrotizing fasciitis caused by Vibrio vulnificus. Eur J Clin Microbiol Infect Dis. 2014 Jun. 33(6):1011-8. [Medline]. Hong G, Wu B, Lu C, Li M, Zhao G, Lu Z. Emergency treatment of 16 patients with necrotizing fasciitis caused by Vibrio vulnificus infection complicated with septic shock. Chin Med J (Engl). 2014 May. 127(10):1984-6. [Medline]. [Guideline] American Medical Association; American Nurses Association-American Nurses Foundation; Centers for Disease Control and Prevention; et al. Diagnosis and management of foodborne illnesses: a primer for physicians and other health care professionals. MMWR Recomm Rep. 2004 Apr 16. 53:1-33. [Medline]. [Guideline] Stevens DL, Bisno AL, Chambers HF, et al. Practice guidelines for the diagnosis and management of skin and soft tissue infections: 2014 update by the Infectious Diseases Society of America. Clin Infect Dis. 2014 Jul 15. 59(2):e10-52. [Medline]. Prutkin JM, Haq R. A dish best served hot. Am J Med. 2006 Apr. 119(4):307-9. [Medline]. Mouzin E, Mascola L, Tormey MP, Dassey DE. Prevention of Vibrio vulnificus infections. Assessment of regulatory educational strategies. JAMA. 1997 Aug 20. 278(7):576-8. [Medline]. Lee TH, Kim MH, Lee CS, Lee JH, Rhee JH, Chung KM. Protection against Vibrio vulnificus infection by active and passive immunization with the C-terminal region of the RtxA1/MARTXVv protein. Vaccine. 2014 Jan 3. 32(2):271-6. [Medline]. Tang HJ, Chen CC, Lai CC, Zhang CC, Weng TC, Chiu YH, et al. In vitro and in vivo antibacterial activity of tigecycline against Vibrio vulnificus. J Microbiol Immunol Infect. 2018 Feb. 51 (1):76-81. [Medline].